From our work with scatter plots, we know that an equation for a line of best fit can be found to model the data and to predict other values in keeping with the relationship. Sometimes, however, a "straight line" is not the best shape (curve) to represent the data. There are actually, many different types of "curves" that can be used to model data. to model the data in a scatter plot? First, some vocabulary: the term "regression" pertains to the process of finding the best fit equation for the relationship seen in a scatter plot. Regression is actually a generic term for all methods attempting to fit a model to observed data in order to predict new values. Interpolate: to make predictions which lie inside the given data range. Extrapolate: to make predictions which lie outside the given data range. 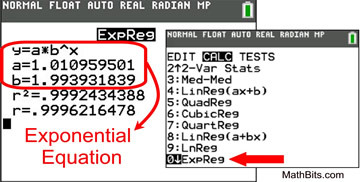 If you have an idea of what different functions look like, you will have an easier time deciding what type of regression is needed for your data sets. 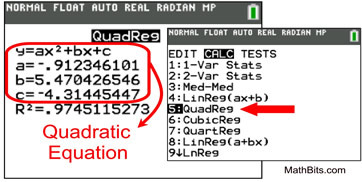 We will be focusing on linear, quadratic and exponential functions (regressions). Does the plotted data resemble a straight line? • the slope may be either positive or negative. • linear associations are the most popular because they are easy to read and interpret. 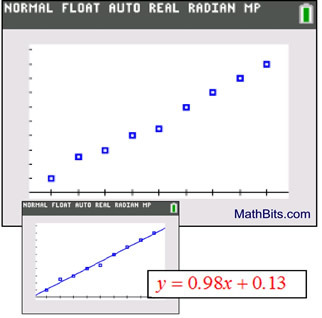 • "line of best fit"
Does the plotted data resemble a parabola, or part of a parabola? • the shape may open upward or downward. • "quadratic of best fit"
Does the plotted data resemble an exponential curve? • the curve will either rise or fall. • the curve will not "turn around" like a parabola. • "exponential of best fit"
It may not always be obvious from looking at the scatter plot which shape (curve) will be the best fit. Some situations may require more investigation before deciding upon a possible shape (curve), and some situations may not be modeled by any of these shapes (curves). 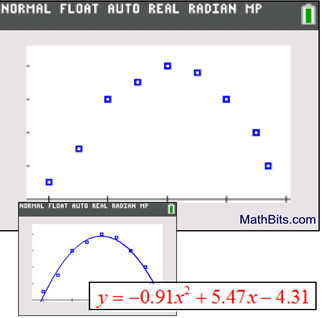 We will be using the graphing calculator to determine the regression equations for our examples. 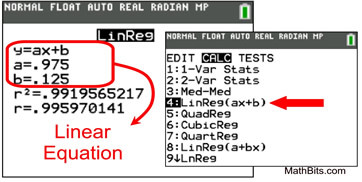 When using the TI-84+ family of calculators, go to STAT, arrow right to CALC, and arrow down for regression equation choices. Does this scatter plot shape look familiar? It could possibly be half of a parabola. The quadratic regression equation can now be used to predict y-values that may lie within the plotted values, from x = 0 to x = 5, or beyond the plotted values. For example, if x = 3½, we predict (interpolate) that y = -0.91(3.5)2 + 5.47(3.5) - 4.31 = 3.6875. It appears to be a straight line with a positive slope. We should use a linear regression. The linear regression equation can now be used to predict y-values that may lie within the plotted values, from x = 0 to x = 9, or beyond the plotted values. 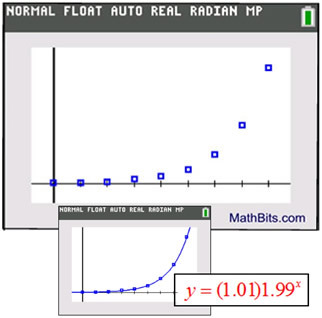 For example, if x = 12, we predict (extrapolate) that y = 0.98(12) + 0.13 = 11.89.
a linear regression can be found using 4:LinReg(ax+b) or 8:LinReg(a+bx). Read about the difference at "LinReg(ax + b) versus LinReg(a + bx)". Keep in mind that when working with real world data, it is unlikely that any regression model is going to be a "perfect fit" (pass through all of your data points). Your goal is to find the model that fits as many of the the data points as possible and will be the best indicator of trends in the data. see Rules for Developing a Model.